Benefits administration technology is reshaping the way employees engage with their benefits – and decision support tools are a significant factor driving this change. To accommodate the needs of a diverse workforce, however, HR leaders must consider the quality and context of the resources they leverage. 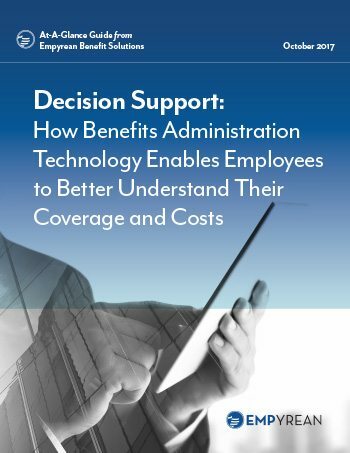 When applied as part of a comprehensive benefits administration solution, decision support tools enable participants to gain a deeper understanding of their options and make smarter, more informed coverage choices. A single tool alone is not capable of supporting every step of your employees’ decision making processes. Participants need easy access to a complete suite of decision support tools within their enrollment experience, to ensure they are engaged and supported at every level. Your benefits administration technology partner should offer the following tools as a key part of your comprehensive solution. These support options will help employees determine how your benefits can best meet their unique needs. Employees need personalized benefits experiences to help them identify and become familiar with their ideal coverage choices as quickly, completely, and individually as possible. This can be a difficult demand to fulfill when using manual methods or outdated technology – but with a modern and adaptable benefits administration platform, providing personalized experiences to your employees is not only possible but also easier to holistically manage. We invite you to download Empyrean’s newest At-A-Glance Guide exploring the decision support tools employers can leverage within their benefits administration platform to empower their employees and strategies. Through your benefits administration partner, you should have access to a broad range of solutions that alleviate confusion and stress, and help employees seamlessly transition into confident benefits consumers – no matter their level of benefits literacy. With the proper partner and resources, you can easily deliver the support needed to improve the impact of your benefits offering for both your workforce and business. As you read, we’d love to get your thoughts. Feel free to contact us with questions or comments at info@goempyrean.com.